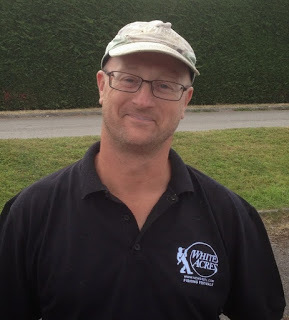 Round six arrived and we were a few anglers short once again, Dave Lawrence was standing in for Janders who is on holiday in Cornwall but there would still be four vacant pegs. The envelope for this weeks draw sequence was picked and Les read out which pegs we were on today, my home was to be peg 18 and it’s not been a great peg this series apart from the first match when Blaker won off it. Peg 10 was vacant again today which might even things up a bit and 20 was also empty. Jamie P was next door and had an empty peg to his right which always helps (and some might say he had an empty peg on his left too!) and Blaker on peg 4 also had a spare peg to his right. With the depleted turnout, Les said he’d pay the top three instead of the usual four and only three sections today. As I was setting up, the first thing I noticed was that hardly any carp could be seen cruising about but I still thought I’d catch shallow. I set up the usual three rigs to fish shallow, at five metres and down the edge and for bait I had 6mm and 8mm pellets plus some 6mm meat to which I gave a couple of squirts of Bait Tech’s Krill and Tuna liquid. Les signalled the all in at 10:30 and I started with the shallow rig at 11.5 metres and also fed a few pieces of meat on my other two lines. Blaker flew out of the blocks with a carp from his inside line, then Exeter Mike had one followed by Jamie P, I had my first carp after about 25 minutes but was already two or three behind Blaker and Jamie and they were bagging. I added another as the first hour came to a close but I was a long way behind those two, so with Jamie P catching on the deck and Blaker catching in his margins, I decided to try my five metre line. I tried it for ten minutes and once again I never had a bite there, Jamie P went out with his shallow rig and had a carp first put in! I tried my meat rig on the longer line but with no indications and Blaker and Jamie now approaching ten carp apiece, it was time to try my inside line much earlier than I would have liked. There were signs of fish there in the shallow water and I had three carp including a good one of 5-6lb over the next hour or so but Jamie P added four of his own from his margin and both him and Blaker were now at least ten fish ahead of me. Apart from those two, nobody I could see was catching that well, Exeter Mike had a couple in peg 5, Paul H next to him had two or three and Bushy had lost a good fish in peg 7 which had triggered a bout of temporary Tourette’s. Les was getting a few rudd and of course had his usual eel, Oz in peg 1 had a couple on the feeder but the wind had blown loads of that fluff into his swim which meant fishing the pole was nigh on impossible. Picky walked up from peg 19 and said he was struggling and had caught two carp so at least that pound was safe for the time being. Les provided the entertainment when snake swam into his peg and he managed get it in his landing net, I’m not too sure he knew what he was going to do with it next but it was released safe and sound. So at the halfway point, Blaker and Jamie P were both looking like they would do big weights but it was hard going for the rest of us. Odd fish could now be seen swimming about so I went back out with the shallow rig and had two in as many chucks but the action was short lived, Blaker had a spell where he lost several fish in the lilies or due to hook pulls and much swearing followed. Exeter Mike and Paul H were now getting odd carp from their inside lines and Bushy had a couple shallow. I kept trying my inside line but had no more bites and I went back out on my longer line with the depth rig and banded pellet but couldn’t get a bite on this either, unlike Jamie P who was still catching really well and getting some good fish despite trying to tell Blaker they were only 2lb each. I had two more carp shallow to put me on nine with the bites just coming out of the blue, I then had a 3oz skimmer on 6mm banded pellet so spent the last ten minutes on the inside line but never added any more fish and I’d been properly battered off the next peg today. After packing up we all gathered at Oz’s peg to watch the weigh in, he had 15lb 2oz and the fluff hadn’t done him any favours today, Les the snake charmer didn’t bother the scales and then after three weighs, Blaker’s total was called at 73lb 12oz, a great weight but I didn’t think it would be enough today. The next three weights were all very close and started with Exeter Mike who had 27lb 4oz and then Paul just pipped him with a level 29lb before Bushy fell just short with 27lb 14oz from peg 7. Dave (fishing for Janders) had 14lb and then Mike Collins had 7lb 2oz, peg 10 was empty and Dunner had nine carp for 37lb 4oz in peg 11, Butch had 18lb 4oz in peg 12 and then Bish had ten carp for 39lb 14oz from peg 13 to go into third place. 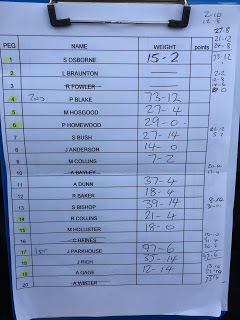 Richard Collins had 21lb 4oz and then the Hoff had 18lb from peg 15. Then we got to Jamie P and after his three nets were weighed his total was called at 97lb 6oz, an excellent weight and I paid him a nugget. My nine carp and a small skimmer went 35lb 14oz, Picky’s four carp pulled the scales round to 12lb 14oz so I took a nugget off him and finished 2-1 up in the side bets. Back at the car park and Jamie P was confirmed as the winner for the second week running, Blaker was second and Bish third. The section winners were Paul H, Dunner and me so I picked up £25 which helped pay for a sack of pellets that Bushy got for me, cheers mate. Previous: Previous post: So you want to be sponsored?